Congratulations and felicidades to our newest San Luis Obispo County "Empezando" graduates! On November 16, seven dedicated students completed Mission Community Services Corporation's ten-week "Empezando" business start-up class. Special guest speakers included Ana Rodarte, a past Empezando graduate and owner of Las Delicias de Zacatecas, Fernando Sanchez, Cal Poly Professor, as well as Wells Fargo representative and past Empezando instructor Carla Blandon. Thank you to our sponsors PG&E, Cuesta College and their Doing What Matters program, U.S. Small Business Administration and Wells Fargo Bank for making this possible. The Board of Directors and staff at MCSC are very proud of these students for the months of hard work and commitment to achieving their goals. Please join us in wishing them all the very best as they begin their business ventures! 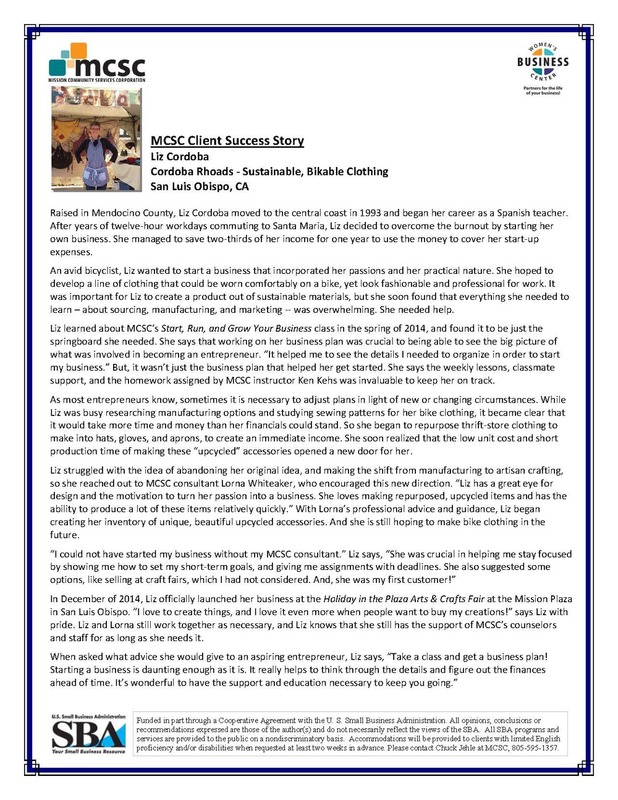 Read about how MCSC was able to help Carol expand her business. Congratulations Liz on opening your new business! Popular Start, Run & Grow class to start September 16. Starts Sept. 3, 2014: Complete training in Quickbooks Premier. Upon completion of the course, you will be able to use QuickBooks effectively to best meet the needs of your business. Class can be taught in English or Spanish. Starts Sept. 2, 2014: A 10 week course in 3 convenient locations that provides Self-Employment Training. Receive weekly training in the most important aspects of planning, financing, marketing and managing a small business. Develop a Business Plan including a business description, marketing strategy, cash flow projections, operations plan, and a network to help sustain the business. Funded in part through a Cooperative Agreement with the U. S. Small Business Administration. All opinions, conclusions or recommendations expressed are those of the author(s) and do not necessarily reflect the views of the SBA. Reasonable accommodations for persons with disabilities will be made if requested at least two weeks in advance. Please contact David Ryal with MCSC/WBC by calling 805.595.1357. Funded in part through a Cooperative Agreement with the U. S. Small Business Administration. All opinions, conclusions or recommendations expressed are those of the author(s) and do not necessarily reflect the views of the SBA. Reasonable accommodations for people with disabilities will be made if requested at least two weeks in advance. Call MCSC Program Director at 805-595-1357. MCSC is an equal opportunity provider. MCSC is a 501 (c)(3) non-profit organization. We understand the financial struggles that many new entrepreneurs and small businesses face when starting out. That’s why we work so hard to keep all of our services either affordable, or completely free! Because we are partially funded through the SBA, your donation to the Mission Community Services Corporation goes farther than you might think. Every dollar we raise helps more local entrepreneurs gain access to workshop, classes,training services, business counselors, and a comprehensive library of resources. Please consider investing in our local economy by making a donation to MCSC. We are a 501(c)(3) corporation, so your contribution is tax-deductible. It’s easy to donate, please go to our ‘Support MCSC’ tab, or call our offices at 805-595-1357. Thank you! © 2016 Mission Community Services Corporation, All Rights Reserved.